Create an extraordinary multi signature end band hand bound book with inked and painted Masa papers. 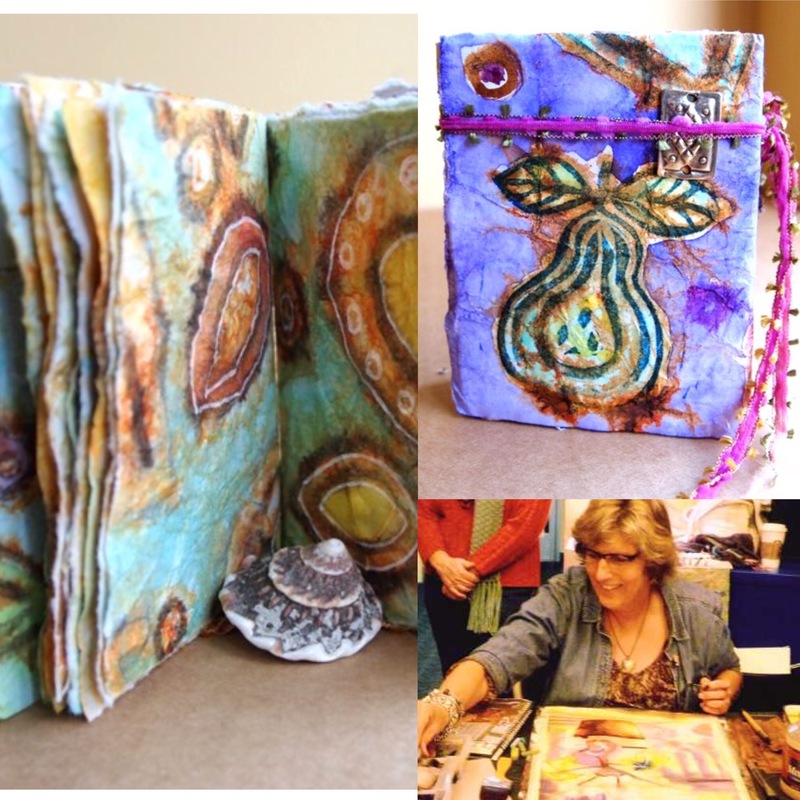 You’ll learn at least 5 techniques in this workshop including dropped- in color, ink batik lines, Masa paper process, and book binding techniques to stitch signatures with end bands. We will explore a special batik-like technique with Masa rice paper to create the folios and cover papers with stamps, acrylic inks and watercolor washes. The paper quality is ever so soft in the finished book…a book you’ll love to pick up again and again. Helen will provide stamps and stamp pads, foam brushes , brushes for inks, and other tools to use while we work, as well as Masa paper, PVA glue, acrylic inks, waxed linen thread, adornments, ribbon. Registration is now open. To reserve your seat you will be required to mail Elitia a postdated cheque for May 15, 2017 to reserve your seat. Unfortunately, no refunds on cancellation after June 1, 2017 – a credit will be applied to future workshops at my home studio.